Our first day in Wales was about finding Welsh beer. We landed at Holyhead mid-day Friday and drove towards our first destination. The first stop was Conwy Brewery which we found quite easily. Merideth and I walked into an empty tasting room. There was a sign that indicated to push the button for assistance which we did… and waited. We could hear activity in the back but no one appeared. After about 15 minutes and three button pushes, I decided to ring them with my cell phone. We could hear the phone ringing in the back and someone did answer. I asked if it would be possible to taste their beer. The person in the back replied that they were in the middle of bottling and could he have my number to arrange a more convenient time later in the day. I explained that we were actually standing in their tasting room and that unfortunately we were staying 40 miles away so later in the day wouldn’t be convenient. We chuckled as we left and pushed on to our final destination. We stopped in the touristy village of Betws-y-Coed for a late lunch. Here I made a tactical error. We passed on a restaurant serving Cardiff-based Brains and another south Wales brewery and continued a search for some local brew. We ended up at a cozier restaurant that had only English beer. 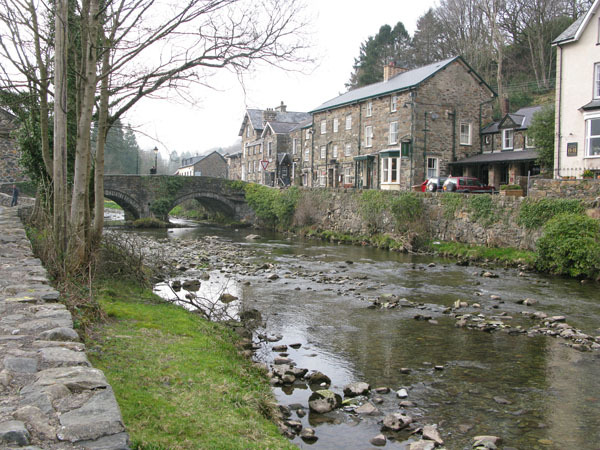 The village we are staying in, Beddgelert, has three pubs. While a very quaint and picturesque little community, there is no Welsh beer to be found. The pubs are all tied to an English brewery, Robinsons. The beer is OK. Well, some of it is but we didn’t come to Wales to drink English beer. Our first day in Wales ended without tasting any local brew. Our big break came on Saturday. While hiking on the trails above the village of Llandberis we came across a traditional Welsh tea room with a Conwy Brewery sign out front. Needing a little break, we decided to check out Pen Ceunant. 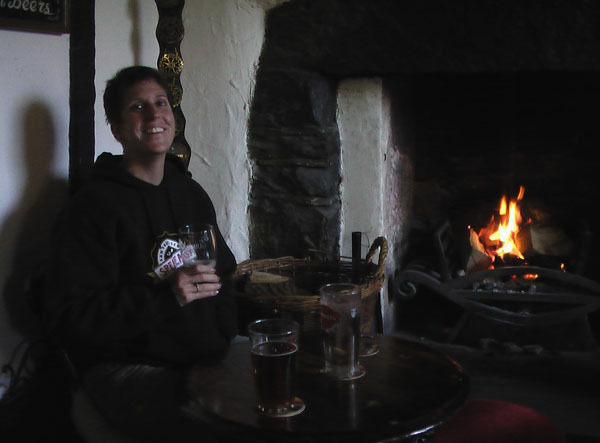 Situating ourselves in front of a cozy fire in the front room, we ordered two Conwy beers, Welsh Pride for Merideth and Celebrator Ale for myself. The beers were absolutely wonderful! Located on one of the main trails to the top of Snowdon, Pen Ceunant gets a steady stream of friendly hikers and cyclists. While enjoying the fine ales from Conwy, we chatted with a lovely couple from Liverpool who frequent the Snowdonia Park and are regulars at the tea room. With the first Welsh beers under our belt, it was time for out first Welsh brewery to add to The List. That distinction goes to Snowdonia Parc Brewpub. Snowdonia Parc was an interesting place. Their facility included a campground and it was the first place that we heard Welsh being spoken in a conversation. The first beer we tried was Snowdonia Ale, a 3.8% Pale Ale. It was nice but not as nice as the 4.4% beer I tried which was called Karma Sutra or Carmen Sutra. We couldn’t quite see the name on the handle behind the bar. On our way back to our hotel, Merideth spotted a sign that said “9 Real Ales 9 Days a Week”. I know it doesn’t maker sense but, of course, we had to stop. 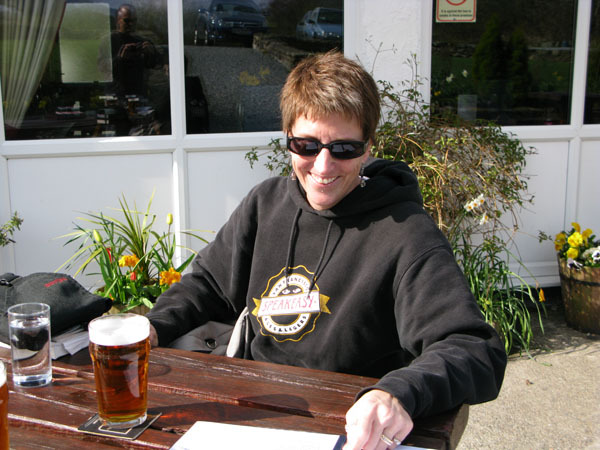 Turns out the pub, Cwellyn Arms in Rhys Ddu (don’t ask how to pronounce either.) was CAMRA’s 2000 Pub of the Year. And it’s in the CAMRA Good Beer Guide. Thumbs up to Merideth for her eagle eyes! 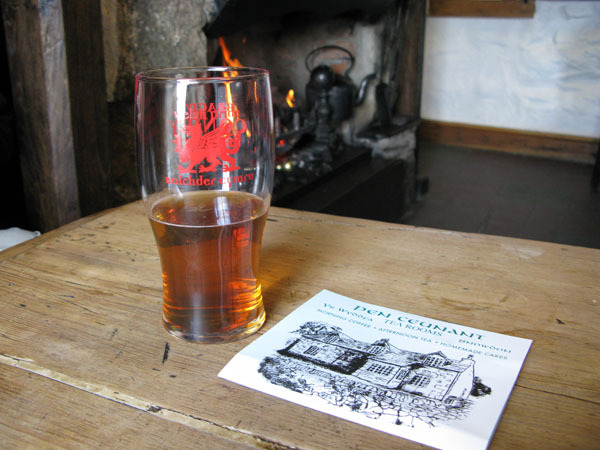 Before a nice fire at Cwellyn Arms, we were able to try a cask version of the Celebration Ale from Conwy as well as Honey Fayre, their Golden Ale flavored with Welsh honey, and Rampart, a darker beer whose style I am unsure of. It was time to call it a day. The big hike was the next day and we needed some rest. But we finally had tried Welsh beer!